1.6. How to Measure Social Capital? 5.3.Is Entrepreneurship Affected by a Certain Type of Social Capital? Monika Mularska-Kucharek is a PhD graduate in Sociology and a lecturer at the Department of the Built Environment and Spatial Policy at the Faculty of Geographical Sciences, University of Lodz. Her research interests focus on social capital, quality of life and entrepreneurship. She is interested in psychology and psychotherapy. She participates in Professional Psychotherapy Studies at the Brief Therapy Center. She is a trainer of psychosocial skills. She is the author of "Kapitał społeczny a postawy i działania przedsiębiorcze mieszkańców Łodzi" ("Social Capital Versus Entrepreneurial Attitudes and Actions of Lodz Residents"), "Kapitał społeczny a jakość życia. Na przykładzie zbiorowości wielkomiejskiej" ("Social Capital and Quality of Life. A Study of A Metropolitan Population"), “Social Capital and Quality of Life” and numerous scholarly articles. The presented book concerns itself with two, currently relevant, issues. Namely social capital and entrepreneurship. It is an exemplification of the author’s academic interest with the role of social capital in shaping entrepreneurial attitudes and activities. 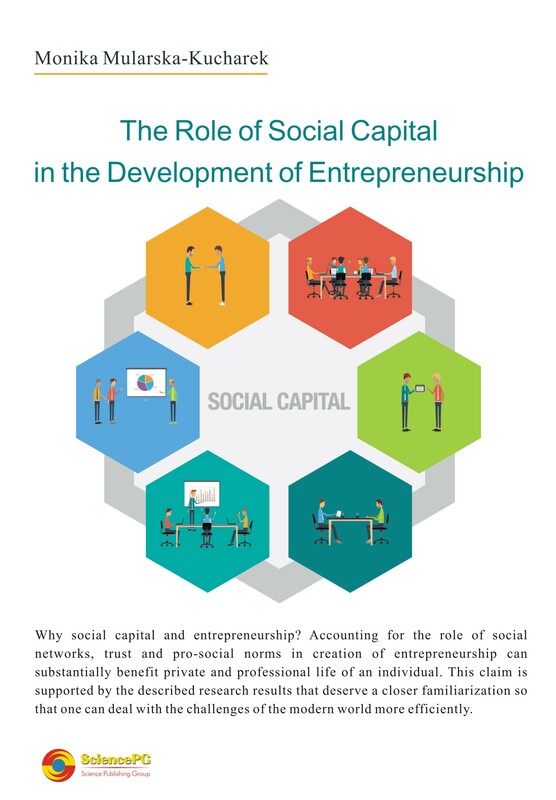 That is why the fundamental goal of the undertaken scientific endeavours described in this work, is to indicate the role of social capital in the development of entrepreneurship as well as assessment of the relations between those two social phenomena. The focus of the book was the individual concept of social capital, according to which that capital is perceived as the resources of individuals that uses those resources in their actions and that are contained in their social relations. When analysing the connection between social capital and entrepreneurship in both the theoretical and empirical dimensions, two perspectives of the subject were considered: the sociological one and the psychological one. The acquired can prove to be inspiring for both the representatives of the world of science and the designers of social life as well as everyone who wishes to achieve much more in material and immaterial aspects of life because of the range of the analysed phenomena.